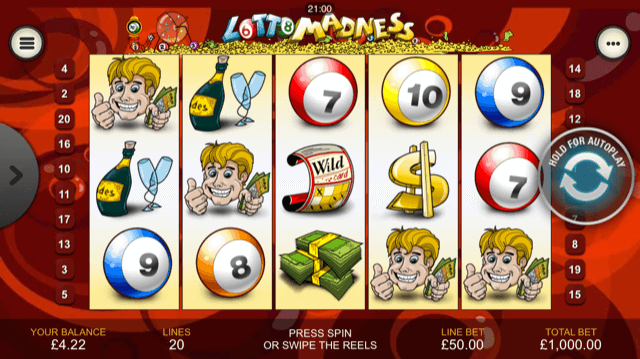 Lotto Madness slot machine is a classic jackpot game from Playtech that whilst now looking quite graphically dated yet has the opportunity to win a pretty big jackpot of 20,000x line bet. The mobile slot also has a great bonus feature which is called the Wheel of Fortune and gives you the chance to win 20 free spins with a 10x multiplier. For all the details of this game read the full Lotto Madness slot review below. If you’re one of those people who’s always dreamt about what you would do with the money from a big lottery win, but at the same time have the wherewithal to realise that the odds of ever landing one are slim to none, the Playtech slots team have just provided the answer in their quirky Lotto Madness slot. A five-reel, 20-payline title, the Lotto Madness slot machine boasts a relatively straightforward design that features familiar coloured balls, champagne bottles and grinning winners clutching lotto tickets on its reels. The background is similarly covered with lotto paraphernalia, while all of the buttons are bright and clearly labelled and the Dollar Ball progressive jackpot ticker is present to the top right of the reels. This is significant as although Lotto Madness is playable from as little as £0.20 per spin, should players raise that stake to £1.00, they’ll be able to play for the aforementioned prize pool. If they elect not to, meanwhile, the game boasts a regular jackpot of 20,000x for five high value icons in the base game. In terms of bonus features, Lotto Madness has just one main distraction from its base game reels, but it’s the Dollar Ball progressive jackpot that is actually the star attraction. The reason we don’t really count the latter as a bonus feature is that this is an automatic extra that is present across a range of mobile slots and – fittingly – sees players entered into a lotto draw where they can win the jackpot displayed. While the ins and outs of how this works are well documented elsewhere on this site, Lotto Madness’s bonus feature is unique and merits more explanation here. To activate it, players must land the Crazy Wheel bonus symbol on reels one and five simultaneously and they’ll be whisked off to a new screen. Here, they’ll get to spin the Crazy Wheel to reveal a number of free spins and a multiplier – with the former going up to 20 and the latter up to 10x – and further Crazy Wheel spins can also be collected. Overall, there’s nothing all that remarkable about the Lotto Madness slot and while the game is reasonable enough to play, the overall feeling is that of a slot trying to appeal to a more lotto-based demographic. Like the Lotto Madness slot review? Check out these as well…..